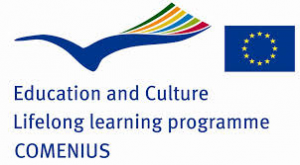 Una nueva andadura para el proyecto Comenius “Working with people, Moving people and their ideas”, ahora le toca el turno a Bitonto (Italia) y su película “Si Púo Fare” donde Adriana, Esther, Jose, Laura y María, todos de 1º de bach y capitanead@s por Gracia y Susana van a derrochar durante la próxima semana su arriesgada puesta en escena, que aquí os mostramos en un vídeo, sus ganas por conocer gente y trabajar con alumnos de otros 6 países. A la vuelta nos lo contarán… See you soon!!! Spanish team started the adventure on Saturday 20th. We travelled to Madrid and we slept there. On Saturday we travelled to London and we spent seven hours in the airport because the flight was deleted. Luckily, we walked on London’s floor to catch the next flight to Zagreb (Croatria’s capital). We arrived at night and we travelled during 4 hours to Vinkovci. While we were coming wgmaile were nervous and anxious. The train stopped in the station. We closed our eyes and held our breaths waiting for the emotion of meeting our hosts. We get off the train and a group of girls started to run towards us. We couldn’t see anything, just feeling. We felt huges, emotions and this was the moment when we forgot our language and we started to speak in english. Durante los días 21 al 26 de septiembre nuestro centro participará en el 4º encuentro Comenius que tendrá lugar en Vincovci, Croacia. Vuestros compañeros y compañeras David Castejón, David Ruiz, Cristina Martín, Carmen del Mar Rosa y Mari Carmen Rojas, acompañados por las profesoras Rosa García y Lourdes Ventura, representarán a nuestro instituto en esta ciudad de Croacia. Su participación consistirá en la proyección de un corto elaborado por ellos mismos y otros compañeros vuestros titulado Veiled Hearts, presentación de dicho corto, intervenciones en cineforum, y en todas aquellas actividades que el alumnado y profesorado croata ha elaborado para el encuentro. No estarán solos, si no que compartirán esta experiencia con otros seis países participantes. Desde aquí les deseamos una feliz estancia en Vincovci. Desde el Equipo Comenius queremos informaros de que se está celebrando en Amiens, Francia, el 2º Encuentro Comenius, dentro del marco europeo de proyectos educativos. Como sabéis nuestro centro está participando, junto con otros seis países en el proyecto denominado WORKING WITH MOVIES-MOVING PEOPLE AND THEIR IDEAS. Durante estos días, desde hoy lunes 17 de marzo hasta es próximo viernes 21, vuestros compañeros y compañeras de 4º de ESO y 1º de Bachillerato IRENE GUILLÉN ESCOTE, ALEJANDRO BARBA, ANTONIO CARRASCO, SARA RUIZ NOTARIO, acompañados por las profesoras ROSARIO MUÑOZ (del Departamento de Inglés) y SUSANA DÍAZ (del Departamento de Francés) estarán participando en dicho encuentro representando a nuestro Centro. Desde aquí les deseamos que la experiencia les resulte fructífera y una feliz estancia. Suerte a todos y a todas. We were 8 of us, travelling to Portugal to spend six days and five nights at Tavira, to share different languages, different customs and taste the delicious meals Portuguese people cooked for us. 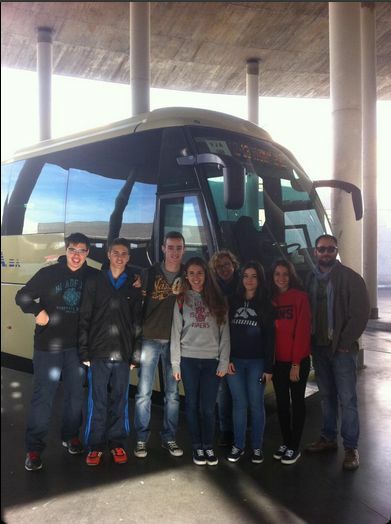 We spent most part of the first day either on the coach or at Seville station. We took our sandwiches near the riverside speaking and excited before our next coming experience, waiting for the coach which would take us to Tavira. At our arrival at Tavira there was nobody there yet, but in less than five minutes all Portuguese students and part of their families were receiving us with a mixture of worry and a smile drawn on their faces. The first minutes were a little cold- Spanish students on the right – Portuguese students on the left like cowboys or cowgirls opposite each other. Then Edite Azevedo arrived and broke the ice with her wide smile and her warm kisses for everybody. From that moment on everything was nearly easy. Families took students to their homes, teachers were taken to our hotel where we met the members of some of the other delegations. After our first dinner I couldn’t say we became old friends but there was a kind of complicity and confidence that made us really enjoy the rest of our stay at Tavira. On the second day we met the rest of delegations and we had the welcome meeting. Students from the different countries were still curious, wondering what everything would be like. It was just a short time. In few minutes all of them knew everything would be great, as it really was. 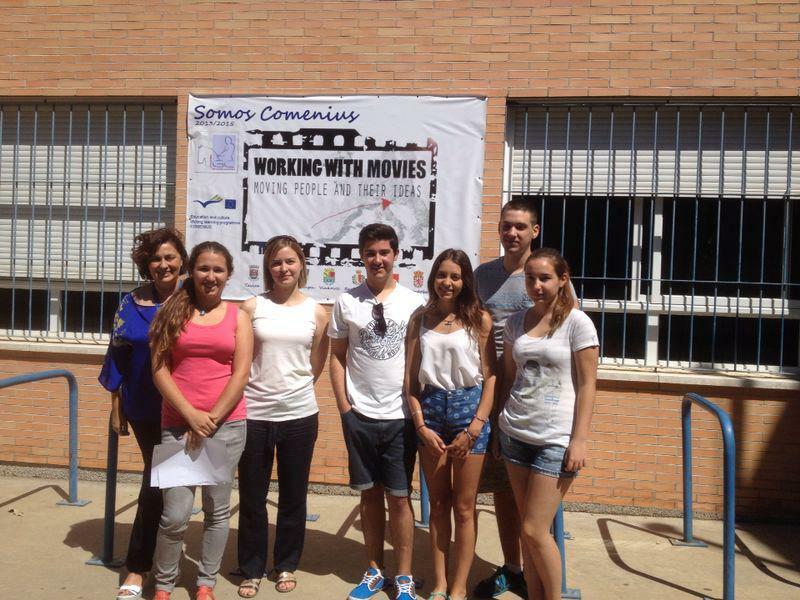 Aunque ya se viene preparando desde hace algún tiempo, ahora se ha puesto en marcha el primer viaje del Proyecto Comenius (Movies Comenius), en el que participa nuestro centro durante este curso y el próximo. 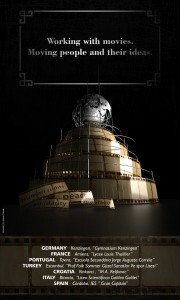 En la imagen podemos ver a nuestros primeros enviados, cuyas vicisitudes podemos seguir en el hashtag #moviescomenius. Encontraréis más información en nuestro blog, Working with movies.